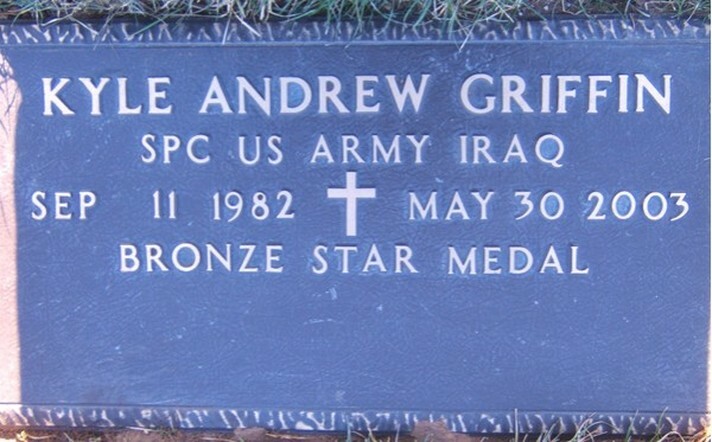 Hometown: Emerson, New Jersey, U.S.
Died: May 30, 2003 in Operation Iraqi Freedom. Unit: Army, 519th Military Intelligence Battalion, Fort Bragg, NC. United States Soldier. A native of Emerson, New Jersey, he was killed during Operation Iraqi Freedom when the truck he was in swerved and crashed while he was travelling between the Iraqi towns of Mosul and Tikrit. His parents were Robin and Ronald Griffin, and he had two siblings, Ryan and Blair. PARAMUS, N.J. — Hundreds of people attended the funeral June 9 for a soldier who was killed in a truck accident in Iraq. U.S. Army Spc. 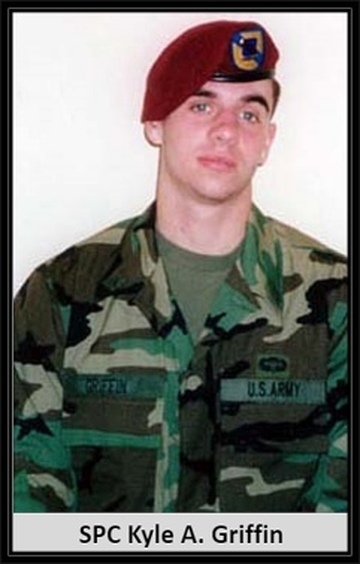 Kyle Griffin, 20, of Emerson, was the fifth soldier from New Jersey to die during Operation Iraqi Freedom. He died May 30 when a truck he was riding in overturned. Griffin, an infantry soldier with the 519th Military Intelligence Battalion out of Fort Bragg, N.C., was remembered as a rambunctious kid who played with toy soldiers as a child. His father, Ronald, told The Record of Bergen County that his son “always wanted to bend the rules.’’ Griffin, who enlisted on July 17, 2001, was deployed to Iraq in February as part of Operation Iraqi Freedom. He was assigned to F Company, 51st Infantry (Long Range Surveillance). “Thanks to people like Kyle, our freedom endures today,’’ said Maj. Gen. Zannie O. Smith, deputy commanding general at Fort Bragg. The Emerson High School graduate also attended the Army Airborne School at Fort Benning, Ga., and had completed the pre-Ranger Course at Fort Benning. Two other soldiers who were in the truck with Griffin also were killed. They were identified as Spc. Zachariah W. Long, 20 of Milton, Pa., and Spc. Michael T. Gleason, 25, of Warren Pa.